Leadership Culture: Is It Motivating or Demotivating Your Employees? While discussing leadership culture during a recent training session, a participant asked me who needed to adapt: the manager to the team or vice versa? Answering this, I spoke about the need for both parties to adapt to each other, as will team members to each other. This is essential for a good team spirit to be established. However, I explained, the manager needs take the lead in this by adapting his/her style to the situation and the people involved. With further discussion, I learned that the culture in his company is very much focused on telling the team to adapt to the manager. There is no encouragement for the manager to adapt his/her style. The participant on my course was finding this very difficult to deal with. So, what did my learner find difficult about his employer’s insistence that the team adapts to the manager? He felt completely undervalued as an employee. 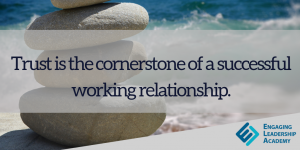 We all know that work is a relationship. We all know that good relationships require both parties to adapt to each other. Poor relationships don’t and usually end as a result. Is This Situation Unique to His Employer? The stark answer to this is no. I recall a situation in a previous job where the Training Manager was briefing me about a difficult project. A manager was having ‘difficulty controlling her team’ and I was to go out and ‘fix the people’. There was absolutely no recognition that the manager experiencing these difficulties had been moved from team to team, due to the difficulties she faced each time in ‘controlling her team’. Initially, I was left wondering how the Training Manager could fail to see the problems with the project she was briefing me to deliver. Then, it was brought up by other middle to senior managers who all questioned how a manager could be treated as such by employees. The problem was cultural. It seemed that a manager (any manager) is always right, regardless of behaviour or actions. The manager was always right as a result of his/her position. Unfortunately, I also encounter examples of ineffective leadership culture all the time through stories told by delegates on my courses. How Does Such a Culture Evolve? This type of workplace culture just doesn’t happen by itself. It evolves over time as the organisation fails to effectively develop its managers into leaders. As a result, as good managers move on to other opportunities, leadership in the organisation can weaken and undesirable behaviours can become established. This certainly was the case in my example above. Below, are some of the giveaway signs that you can look out for in your own workplace. Have a look at communication in your organisation. Can people challenge upwards in terms of suggesting better ways of doing things or making suggestions? Or, is the status quo protected. The challenge function is essential for creativity and long-term success in any organisation. What dominates meetings where you work? Spreadsheets regarding what is done with demands for improvements? Or, discussions about how the work can be done more efficiently and productivity increased? In the company from my example above, huge books of spreadsheets were issued to every meeting participant. Morale was at rock bottom….so was productivity. Who receives leadership development? Or, how is the leadership development budget distributed? If it is mainly at the senior level, the remaining managers will lack the polished soft skills needed to influence, motivate and engage the people working to them. This is mainly a question of attitude and confidence among the leaders in your organisation. Have they developed their approach sufficiently to allow them to trust the ability of their teams and the people within them? Can they delegate and let go? 5. Respect: how is it awarded? Do your managers talk about their respect and trust as prizes to be won? 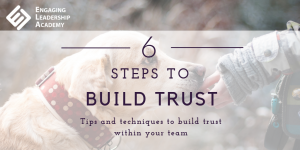 Or, do they trust and respect their people from the outset so each person can feel the value of being trusted? 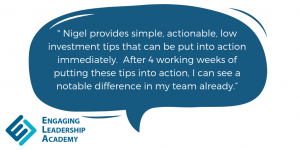 Once this value is felt, most employees will feel motivated to keep it. Of course, an employee can lose it. How do managers in your organisation view the leadership role: as a position to allocate work through instructions or to facilitate the development of motivated and resilient employees choosing to do their best every day? The answer to this will be influenced by the maturity of leadership in your organisation. Do you want to find out if the leadership culture in your organisation is waning? Contact Nigel on nigel@etimes2.com or toll-free on +44 (0)28 9581 8090 for a no-strings conversation.